Ok, I might be jumping the gun at calling it love, but my eyes widened, my heart beat faster and I broke out in a bit of a cold sweat as I watched the Versys roll out of the Kawasaki warehouse. I will admit I have a preference for this style of bike, a “comfort on top business beneath” approach to riding. My impatience to ride would have got the best of me, but first things first, the mandatory walk around. I throw my leg over and settle in to the seat, my legs fold easily into position - nice. I pop it into gear and pull out into city traffic. A few traffic lights, gear shifts and lane changes and I’m starting to think “man, this engine is smooth." I jump on to the highway and roll on the throttle – damn, this thing has some real balls. 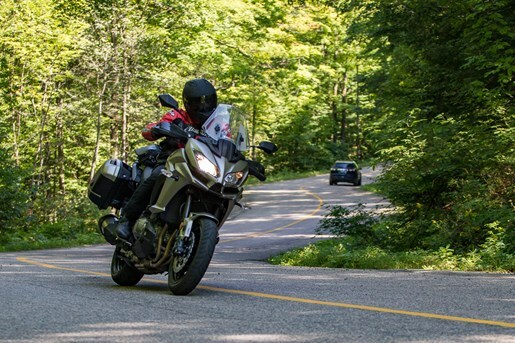 If this was an ordinary test ride I might have started trying to get my head around financing options, but I have the Versys for a week and all of Ontario at my disposal, so I head over to www.GoTourOntario.ca to pick out a route. Balancing needs and wants can be tricky. 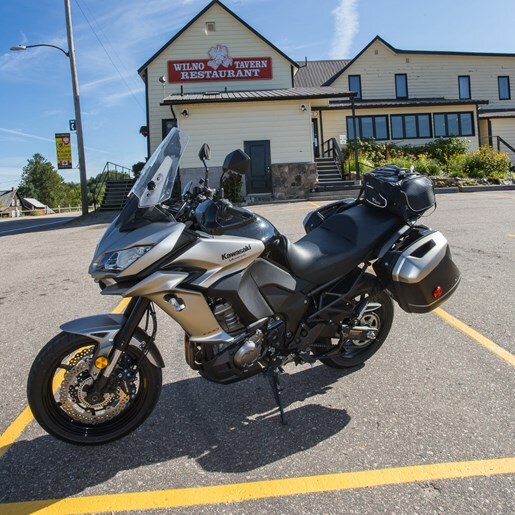 The Versys features adventure bike styling and sport bike performance. It’s got everything you need to live the moto life; from daily commutes to weekend excursions, to the bucket list dream trip. From the first moment I laid my eyes on the 2016 Kawasaki Versys 1000LT back in the warehouse I instantly knew where I wanted to ride it. This bike deserves a landscape of endless corners, hilltops and varied pavement. I stuffed the side bags with a few days worth of supplies and headed towards Ontario's Highlands. 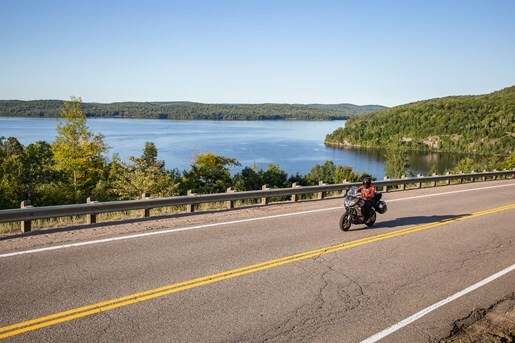 This stretch of the province from Algonquin Park east to Ottawa is a land dotted with thousands of lakes which makes it perfect motorcycle touring terrain; you know you can’t go through them so you’ll just have to go around them - hence the corner bonanza. Once beyond the tentacles of the GTA I have the roads practically to myself and spend the next three hours trying to find a balance between the Versys’s fun limits and local speed limits. We flow through curve after curve easily passing the sparse traffic with a twist of the throttle. The Versys engine, brakes, ergonomics is package that inspires confidence in comfort. Hours pass and, as often happens when the good times are rolling, the day ends too soon. We drop our bags at the plush Bonnie View Inn in Haliburton where we enjoy a delicious dinner and a good night’s rest. Day two, and today’s agenda is to search out the roads that many consider Highland classics: Haliburton Lake Road, Elephant Lake Road, Madawaska Road, Palmer Road; all get checkmarks. 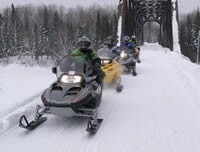 Along the way we partake in some fine barbecue at Olde Ridge, poke around Barry’s Bay and eventually settle in for the night at Hush Lodge and Cottages in the beautiful Madawaska Valley. 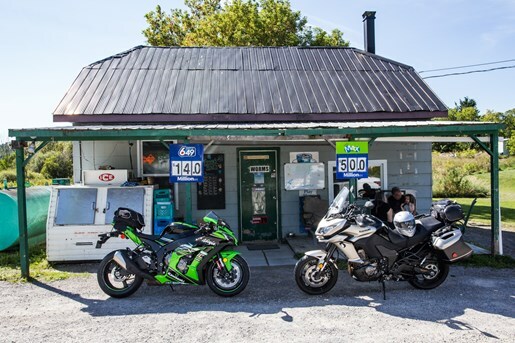 Owner’s Corinne and Gord Evely are recent transplants to the area and motorcycle enthusiasts, which makes for some great conversation.Day three is home bound time. Home happens to be southwest from here so we ride northeast, hey no point rushing things we’ll get there eventually. Here we are, sipping coffee from a styrofoam cup at an uniquely old school general store and gas pump somewhere in the hills of The Ontario Highlands. A little bit lost perhaps but in a good way. 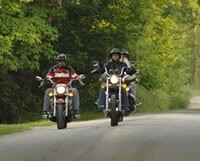 People pass, ask questions about the bikes, about our trip, we laugh, joke the kind of friendly banter that could keep us here all day. As time on the road goes, it doesn't get any better than this, awesome riding under a blue bird sky on a warm late summer day.